Also serving communities of Atco, Mays Landing, Galloway, Linwood, Ocean City. There are 18 Memory Care Facilities in the Voorhees area, with 3 in Voorhees and 15 nearby. The average cost of memory care in Voorhees is $5,602 per month. This is higher than the national median of $4,650. Cheaper nearby regions include Marlton with an average starting cost of $4,600. To help you with your search, browse the 20 reviews below for memory care facilities in Voorhees. Better rated regions include Marlton with an average rating of 4.5 out of 5 stars. Caring.com has helped thousands of families find high-quality senior care. To speak with one of our Family Advisors about memory care options and costs in Voorhees, call (855) 863-8283. In New Jersey, 180,000 seniors currently have Alzheimer's disease. Some of these people are part of Voorhees' own senior community, which makes up nearly 20 percent of the township's population of 29,000 residents. The area is served by the Alzheimer's Association Greater New Jersey Chapter, which provides programs and services for seniors with Alzheimer's and their families. The Voorhees region has 17 memory care facilities, with three in the city proper and the other 14 in nearby cities such as Cherry Hill, Atco and Marlton. While some memory care facilities are housed in stand-alone buildings, most are located within assisted living facilities that offer specialized memory care programming. 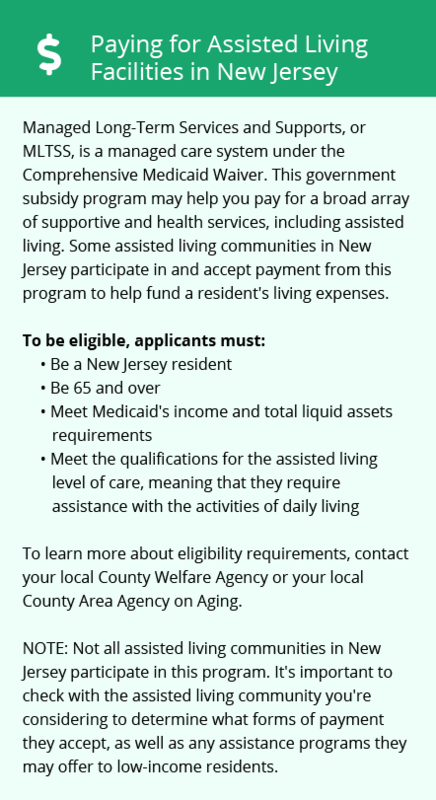 In New Jersey, seniors do not pay state income tax on Social Security benefits, and those over the age of 62 can claim a large deduction on other types of retirement income. This may allow for more money in the memory care budget of seniors living in Voorhees. The overall cost of living in Voorhees is about 18 percent higher than the national average, which can drive up the cost of memory care in this community. By contrast, medical expenses average about 8 percent lower than the national average, which may appeal to families whose senior loved ones have chronic conditions like dementia. Ozone pollution levels in Camden County are high, but short-term particle pollution levels are exceptionally low. Voorhees' air quality may be a consideration for seniors who have respiratory conditions that are worsened by ozone pollution. In Voorhees, summers are very warm and humid with highs in the mid-80s, which may be uncomfortable for seniors who are sensitive to heat. Although winters are chilly with January lows in the 20s, the area receives just 11 inches of annual snowfall, making year-round travel easier for families visiting their loved ones. Memory Care costs in Voorhees start around $5,602 per month on average, while the nationwide average cost of memory care is $4,799 per month. It’s important to note that memory care rates in Voorhees and the surrounding suburbs can vary widely based on factors such as location, the level of care needed, apartment size and the types of amenities offered at each community. 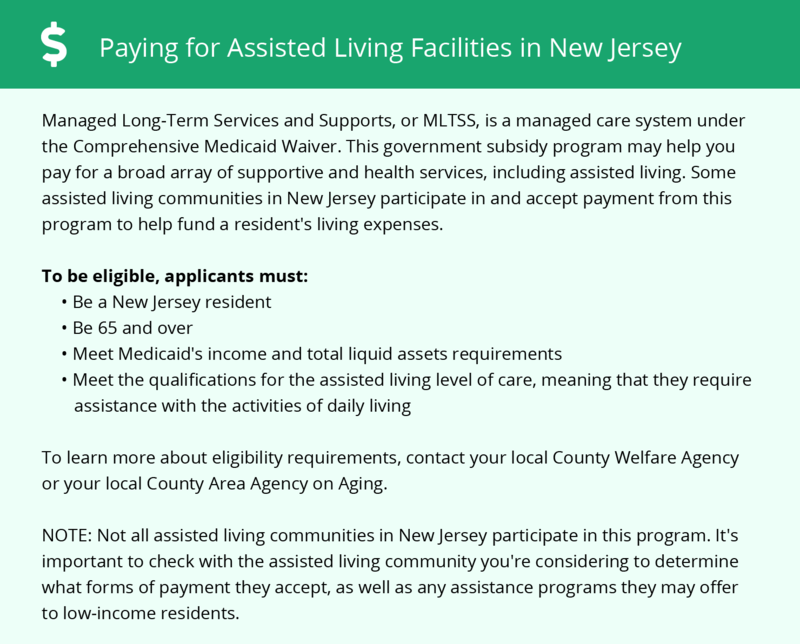 Voorhees and the surrounding area are home to numerous government agencies and non-profit organizations offering help for seniors searching for or currently residing in an assisted living community. These organizations can also provide assistance in a number of other eldercare services such as geriatric care management, elder law advice, estate planning, finding home care and health and wellness programs. To see a list of free memory care resources in Voorhees, please visit our Assisted Living in New Jersey page. Voorhees-area assisted living communities must adhere to the comprehensive set of state laws and regulations that all assisted living communities in New Jersey are required to follow. Visit our Memory Care in New Jersey page for more information about these laws.